Washington, DC - Who among us wouldn’t want to turn back the hands of time? But don’t try to summon the spirit of Ponce de León just yet. According to the FTC, anti-aging claims for TA-65MD and TA-for 65 Skin lacked scientific substantiation. In addition, the FTC challenged the company’s use of consumer endorsements and alleged that it falsely represented that a paid-for segment touting its products on The Suzanne Show was independent programming. 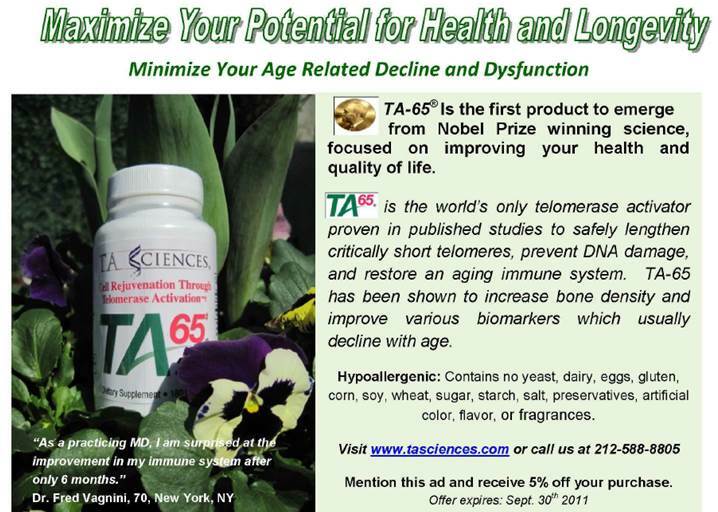 Sold by New York-based Telomerase Activation Sciences and CEO Noel Thomas Patton, a three-month supply of TA-65MD cost consumers as much as $2,000. One fluid ounce of TA-65 for Skin set people back $500. The company marketed the products via online ads, as well as through conferences and seminars aimed at recruiting prospective licensees, most of whom were health professionals. According to the company, their products would reverse aging. The respondents represented – among other things – that TA-65MD prevents and repairs DNA damage, restores aging immune systems, increases bone density, improves vision, and prevents or reduces the risk of cancer. In addition, using phrases like “research-based,” “clinically tested,” and “strongly grounded in scientific evidence,” the company represented that TA-65MD’s aging reversal, DNA repair, immune system restoration, and bone density claims were clinically or scientifically proven. Ads for topically applied TA-65 for Skin said the product would improve skin elasticity and decrease the skin’s recovery time after medical procedures. How were the products supposed to achieve those dramatic results? Let’s start with some science. Telomeres are structures at the end of chromosomes that protect cells when they divide. Think of them like the plastic tip that stops a shoelace from fraying. (As crossword fans know, that shoelace thingy is called an aglet.) Each time a cell divides, its telomeres shorten. When telomeres get too short, the cell stops dividing. According to the company, an ingredient in its products would activate the enzyme telomerase, which in turn would lengthen telomeres, extend the lifespan of normal cells, and thereby provide the advertised anti-aging benefits. But the FTC complaint alleges that the company’s didn’t have sound science to support what it promised. What about the representation that certain claims for TA-65MD were clinically or scientifically proven? False, charges the FTC. The FTC also challenged the format of one particular TA-65MD promotion. According to the complaint, the company paid $89,900 for celebrity Suzanne Somers to promote the product on The Suzanne Show, a program Ms. Somers produced and hosted on Lifetime Television. (She and the show’s producers also received free supplies of the pricy capsules.) TA-65 was featured on an “ask the experts” segment, which was styled as an educational interview of the company’s CEO and a purported medical expert who was a product licensee. During the interview, they touted the supposed health benefits of TA-65MD and directed consumers to the company’s website, with no indication to viewers that the segment was a paid ad. In addition, the company pitched its products in an infomercial featuring consumers who talked about the benefits they purportedly received from using TA-65MD. But the complaint alleges that the company falsely portrayed them as independent users and didn’t make it clear that each endorser had received free products valued at about $4,000 – a material connection the FTC says should have been disclosed. To settle the case, the company has agreed that future claims about reversing aging, repairing DNA, increasing bone density, improving skin elasticity or vision, reducing the risk of cancer, and a variety of other representations will need proof in the form of human clinical testing. Other health-related claims will require competent and reliable scientific evidence. The proposed order prohibits the respondents from misrepresenting that paid commercial advertising is independent programming. They’ll also have to clearly disclose unexpected material connections to endorsers. The FTC is accepting public comments about the order until March 23, 2018. The settlement serves as a reminder to other companies of some established FTC advertising principles. Unsubstantiated anti-aging claims are antithetical to the FTC Act. Advertisers need sound science to support health claims. If you represent expressly or by implication that your product can prevent or treat diseases or serious medical conditions, back up your promises with human clinical testing. Testing, testing. “When the substantiation claim is express (e.g., “tests prove,” “doctors recommend,” and “studies show”), the Commission expects the firm to have at least the advertised level of substantiation.” That’s a quote from the FTC’s 1983 Advertising Substantiation Policy Statement, and it’s just as applicable today. Savvy marketers exercise care before claiming that a product’s effectiveness has been scientifically established. Foil false formats. Decades of FTC decisions demonstrate that it’s illegal to deceive consumers into thinking that an ad is something other than an ad. Don’t dress up paid commercial advertising to look like independent content. Watch your ways and means. The respondents gave promotional materials to trade customers that included allegedly misleading claims that those trade customers, in turn, conveyed to consumers. The complaint serves as a reminder that providing others with the “means and instrumentalities” to engage in deception also can be a violation of FTC law.